In this example we start to approach a real playable game with a score. We give MyWidget a new name (GameBoard) and add some slots. We put the definition in gamebrd.h and the implementation in gamebrd.cpp. t13/lcdrange.h contains the LCDRange class definition. t13/lcdrange.cpp contains the LCDRange implementation. t13/cannon.cpp contains the CannonField implementation. t13/gamebrd.h contains the GameBoard class definition. t13/gamebrd.cpp contains the GameBoard implementation. t13/main.cpp contains MyWidget and main. We need to include qlayout.h now to get the other layout management API. We inherit QWidget in the usual way. We create a QVBoxLayout with all the default values, managing this widget's children. At the top we add the QLCDNumber with a non-zero stretch. Then we add the other two, both with the default zero stretch. This stretch control is something QVBoxLayout (and QHBoxLayout, and QGridLayout) offers but classes like QVBox do not. In this case we're saying that the QLCDNumber should stretch and the others should not. This function returns TRUE if the game is over or FALSE if a game is going on. Here are two new slots: setGameOver() and restartGame(). This new signal indicates that the CannonField is in a state where the shoot() slot makes sense. We'll use it below to enable/disable the Shoot button. This private variable contains the game state. TRUE means that the game is over, and FALSE means that a game is going on. This line has been added to the constructor. Initially, the game is not over (luckily for the player :-). This file is new. It contains the definition of the GameBoard class, which was last seen as MyWidget. We have now added four slots. These are protected and are used internally. We have also added two QLCDNumbers (hits and shotsLeft) which display the game status. This file is new. It contains the implementation of the GameBoard class, which was last seen as MyWidget. We have made some changes in the GameBoard constructor. 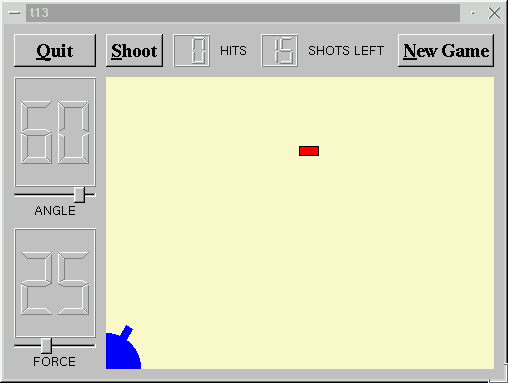 Previously we connected the Shoot button's clicked() signal directly to the CannonField's shoot() slot. This time we want to keep track of the number of shots fired, so we connect it to a protected slot in this class instead. We create four new widgets. Note that we don't bother to keep the pointers to the QLabel widgets in the GameBoard class because there's nothing much we want to do with them. Qt will delete them when the GameBoard widget is destroyed, and the layout classes will resize them appropriately. The number of widgets in the top-right cell is getting large. Once it was empty; now it's full enough that we group together the layout setting for better overview. Notice that we let all the widgets have their preferred sizes, instead putting the stretch just to the left of the New Game button. This slot is activated when the user clicks the Restart button. It is also called from the constructor. First it sets the number of shots to 15. Note that this is the only place in the program where we set the number of shots. Change it to whatever you like to change the game rules. Next we reset the number of hits, restart the game, and generate a new target. You're now ready for Chapter 14.